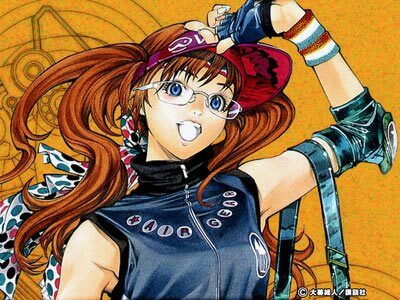 I went out on a limb when I bought the first issue of Air Gear. I was bored and was looking for something new to read. I guess I was kind of curious as to how far the artist could go with a comic about roller blading. Well the artwork was pretty good, so I decided to buy it. Now I find myself being impatient as I wait for each new issue to come out. The story is basically about a guy who lives with three girls/women, who are all sisters and he has been adopted into the family. The story revolves around the main character Ikki, and his journey to become the true King of Air treks (the name of the roller blades that they wear). And hos journey of recruiting new members into his Air ZTrek team. Anway, it's a good read and has some pretty funny moments in each issue.